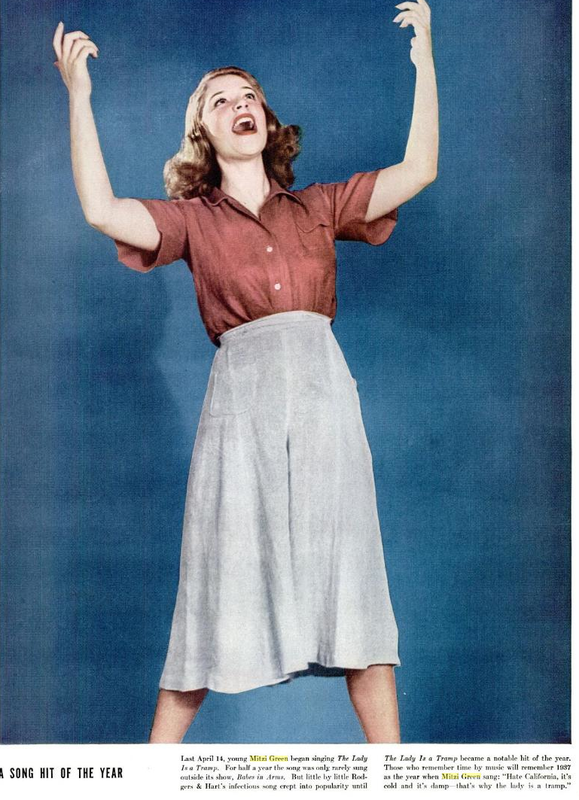 The above bio is from LIFE when she was just 17. 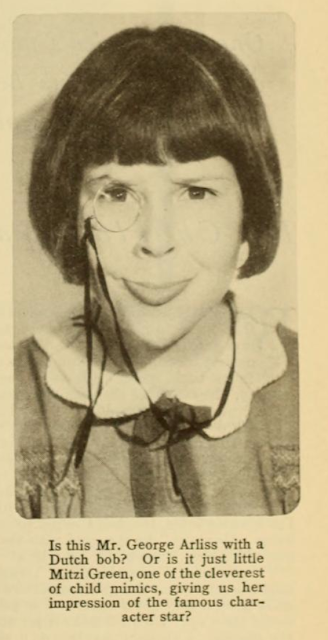 Seen immediately below is her stunningly accurate visual impersonation of actor George Arliss. 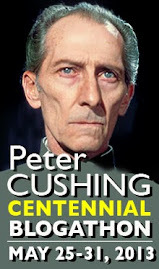 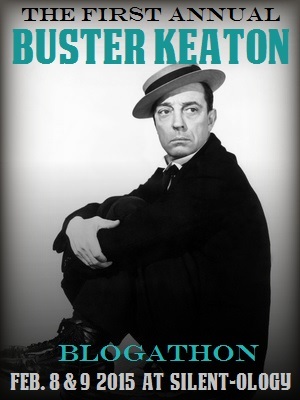 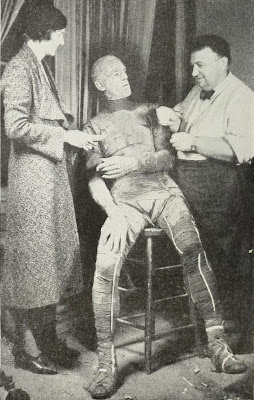 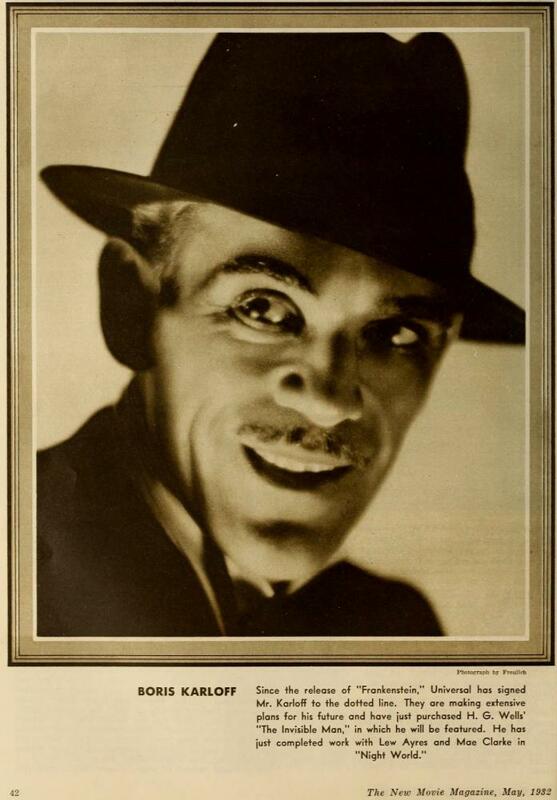 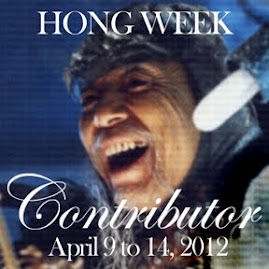 It loses something due to the fact that the once world-famous actor is now largely forgotten except to buffs. 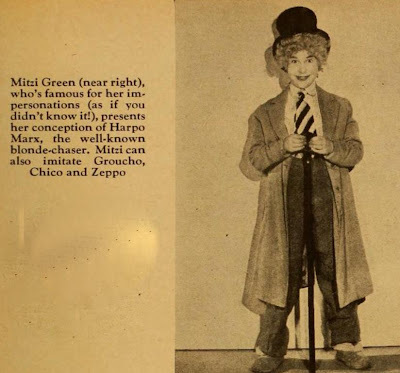 Below that, her Harpo! Seen here at age 16 or 17 on Broadway in BABES IN ARMS where she was the first person to sing the now classic MY FUNNY VALENTINE. 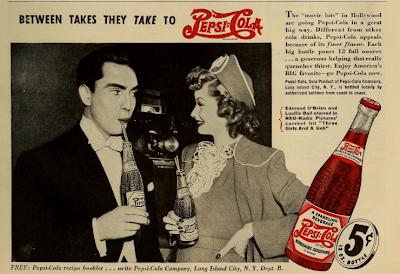 She's with Ray Heatherton, later known as TV's Merry Mailman and still later as Joey Heatherton's papa and co-star of her seventies variety series. 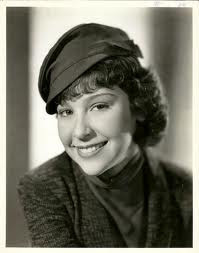 Mitzi also introduced the song, THE LADY IS A TRAMP, later a Sinatra favorite. 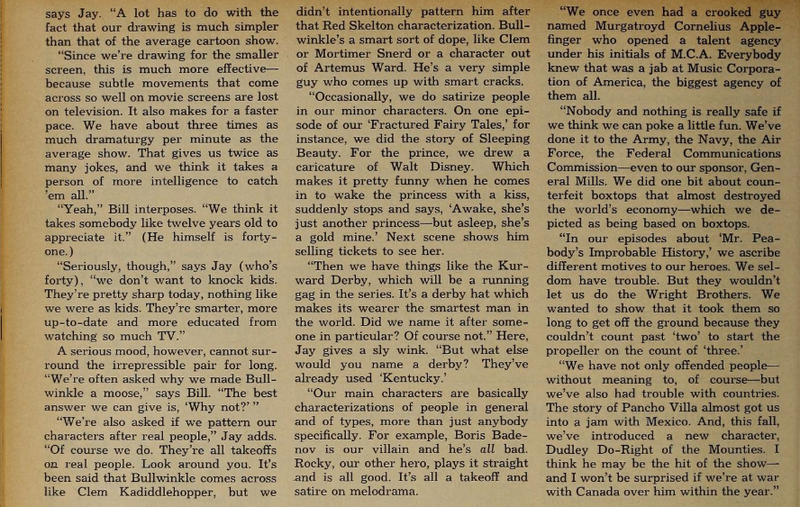 In the television age, child stars became a dime a dozen--interchangeable, expendable fodder to the Hollywood system. 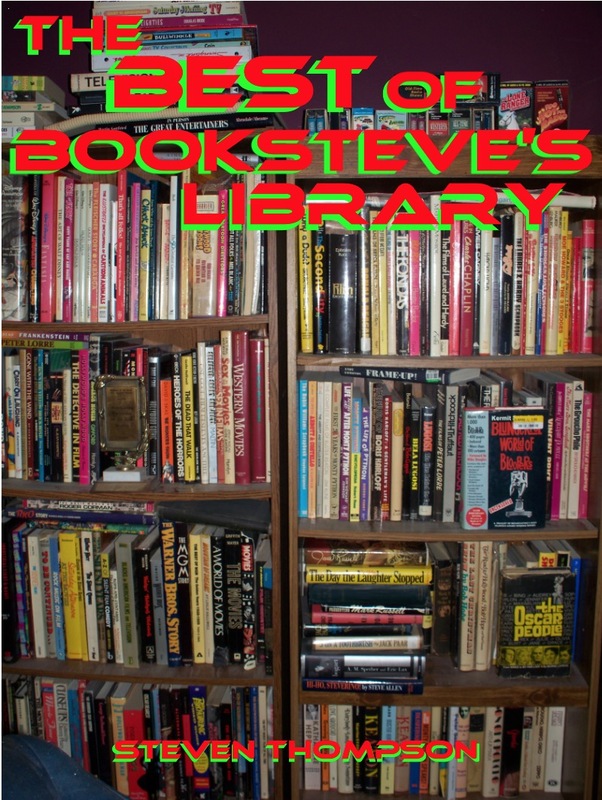 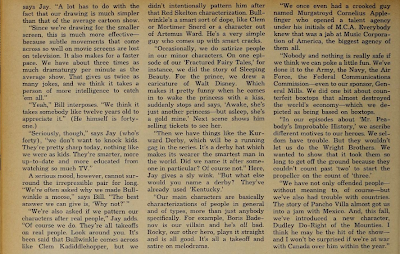 The rare unique ones stood out but they have largely been cookie-cutter for the past half century or more. 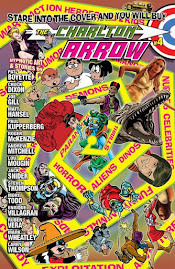 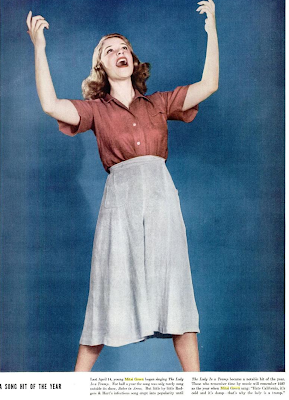 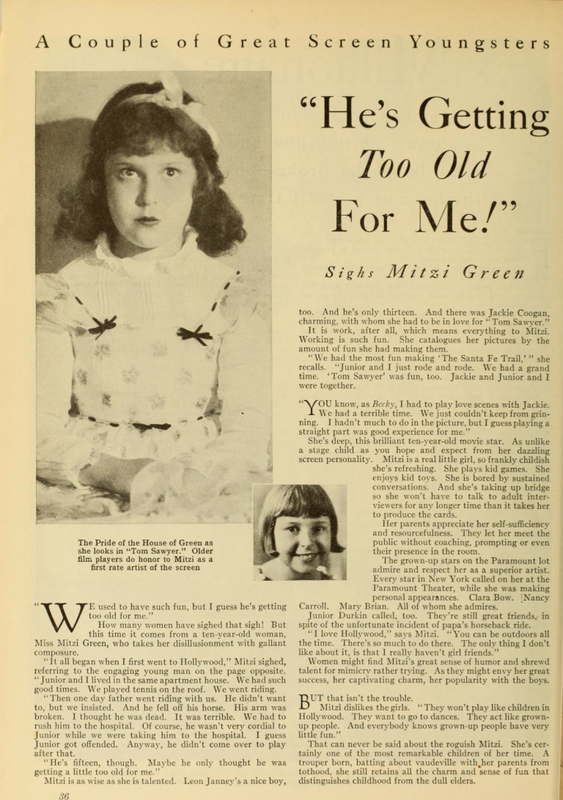 One of my favorite discoveries in my recent mining of online pop culture mags is Mitzi Green. A talented singer and mimic, Mitzi was born in the Bronx in 1920 and, at age 9, took her talent, her gigantic smile and her accent to Hollywood where she played Becky Thatcher in TOM SAWYER and starred as the original LITTLE ORPHAN ANNIE! Mitzi matured a little too quickly for her own good, though. 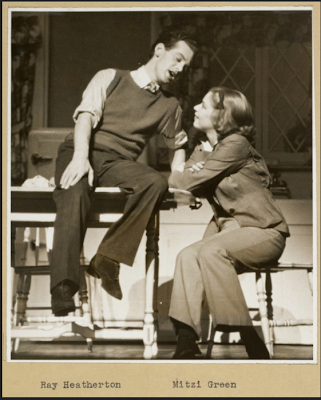 Seen above, in the classic SKIPPY with Jackie Cooper, Mitzi is eleven years old. 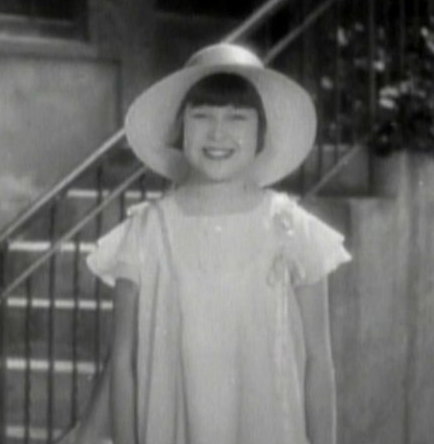 Below, stealing the ending of the all-star THE STOLEN JOOLS short, she was also eleven. 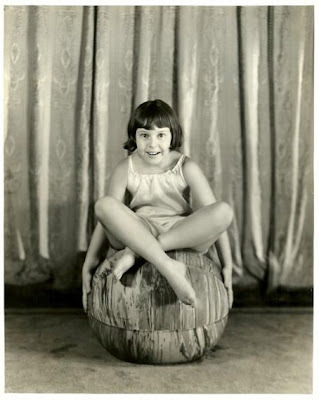 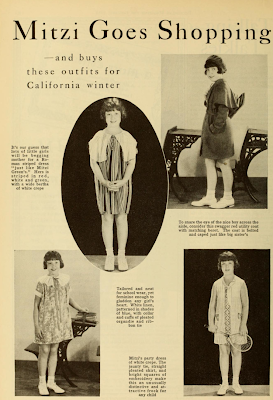 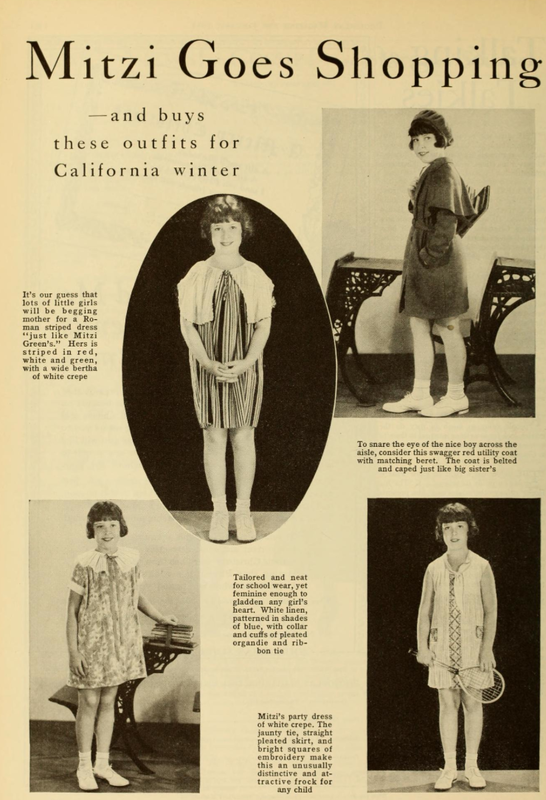 At twelve, below, one could see her maturing already in the Wheeler and Woolsey comedy, GIRL CRAZY. Here's the real killer! 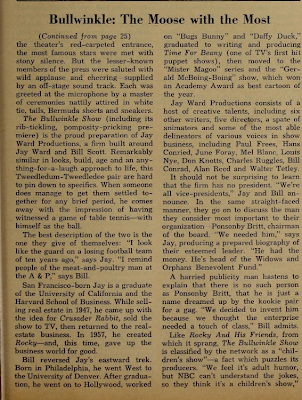 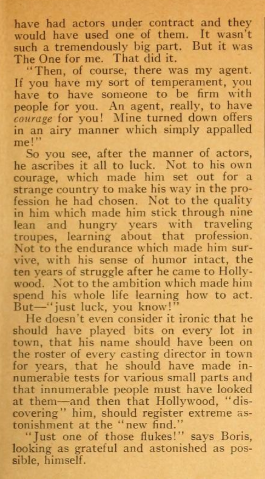 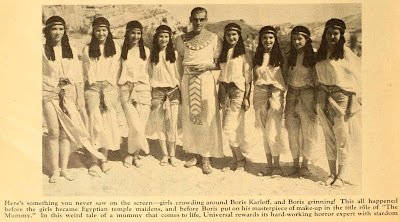 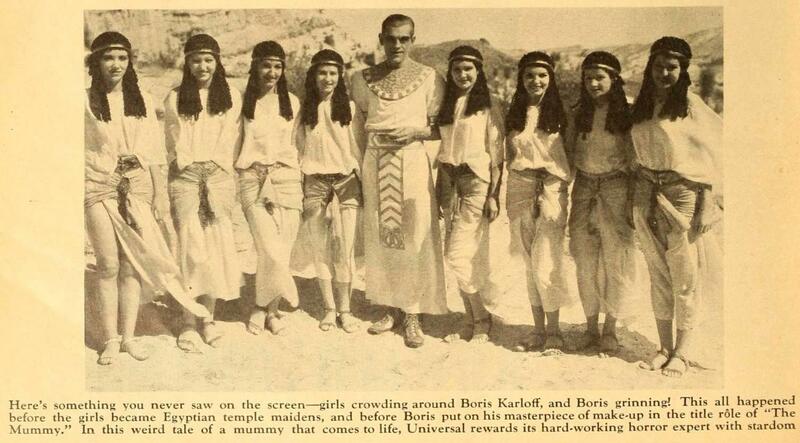 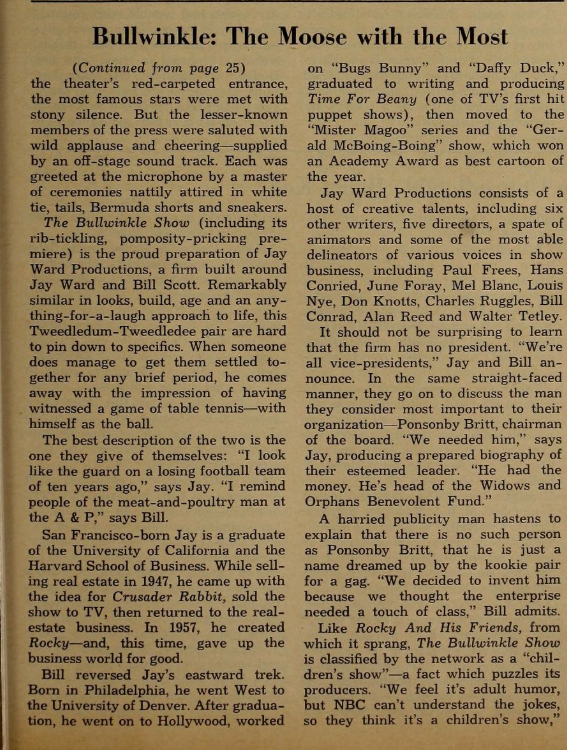 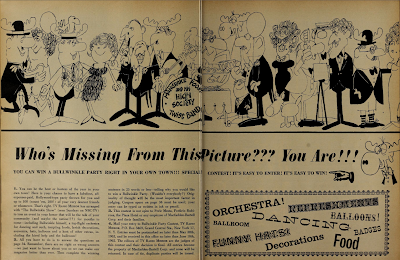 The image below is from the Jack Benny feature TRANSATLANTIC MERRY-GO-ROUND released in 1934! 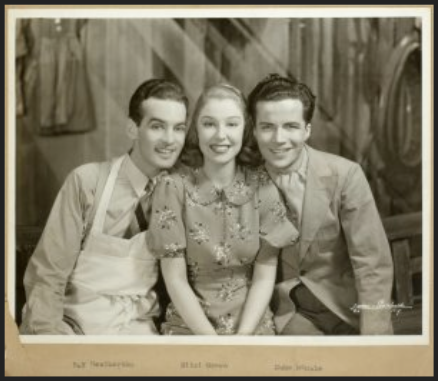 Mitzi in this picture...is FOURTEEN!!! 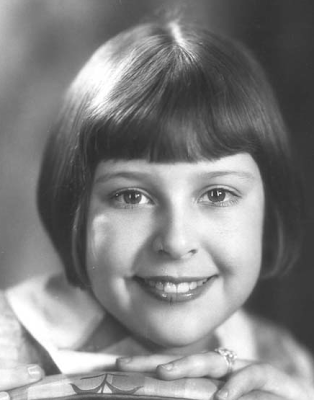 From that point on, she went onto the stage, her amazing career as a child star ended prematurely by puberty! 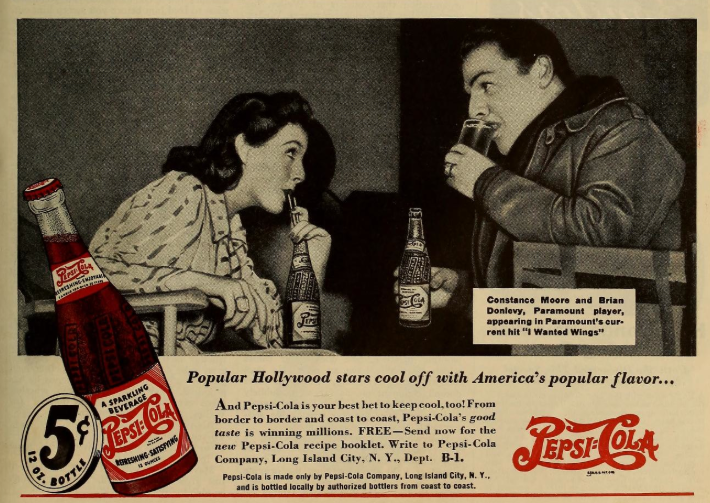 Her one major return to films was in Abbott and Costello's LOST IN ALASKA, thankfully part of the set of DVD's I was recently given so I will be checking her out at age 30 soon. 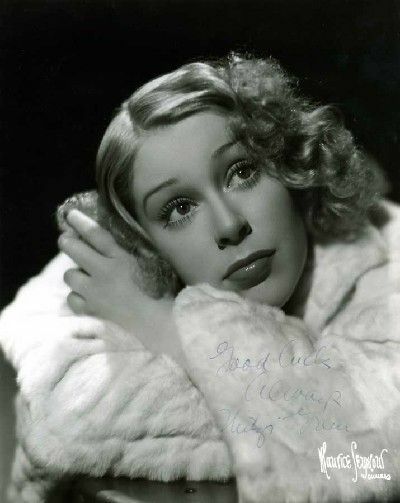 Sadly, Mitzi passed at age 48 in 1969 and is undeservedly forgotten today. 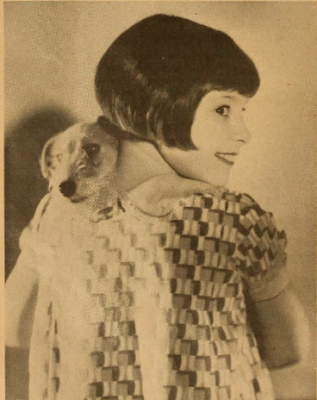 Cute, funny, a good actress and a great laugh. If you get a chance, check out some Mitzi Green movies. 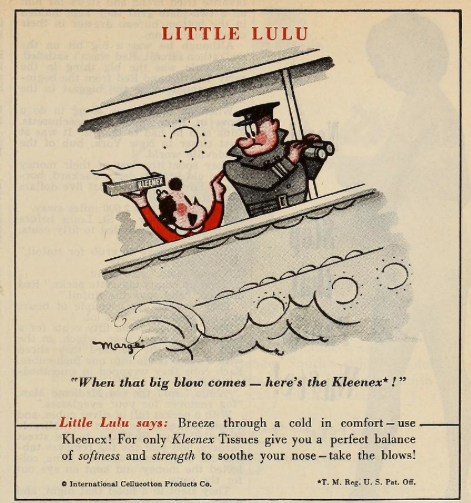 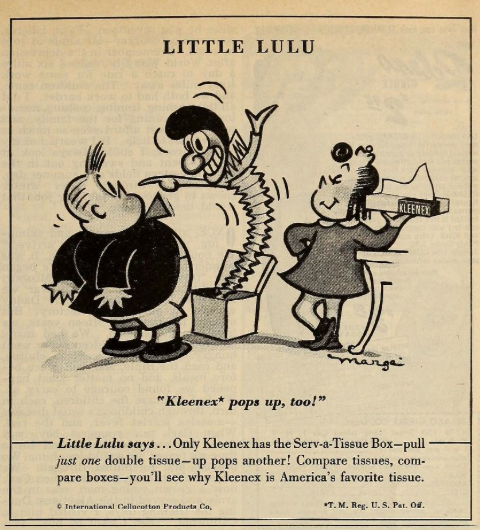 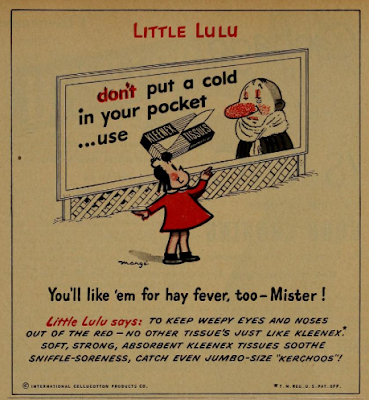 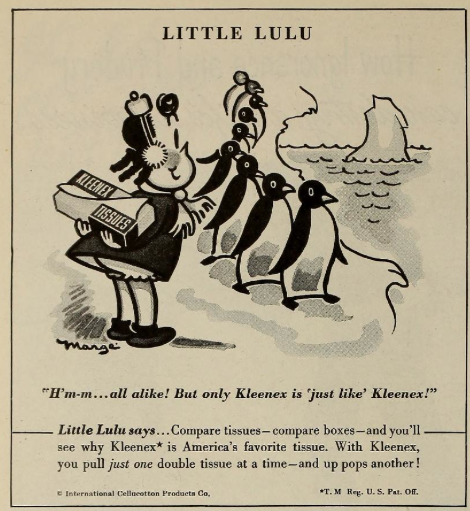 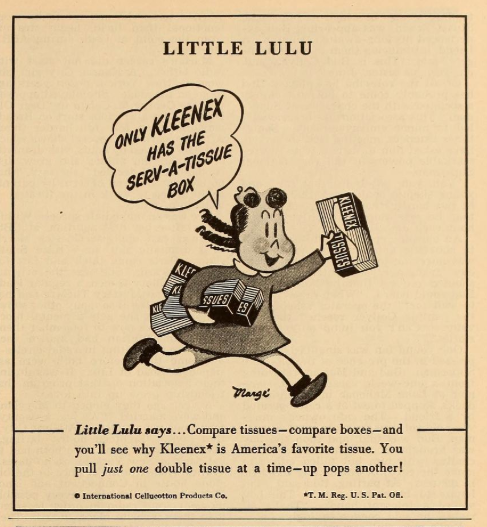 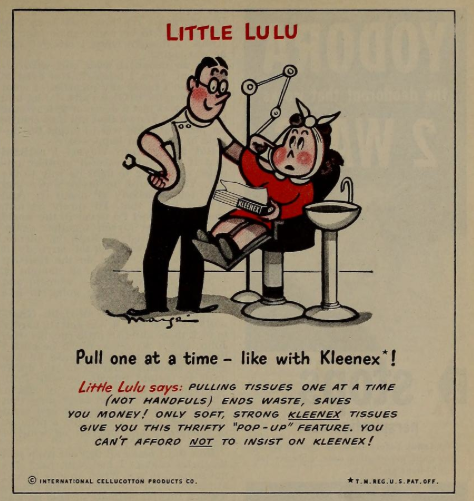 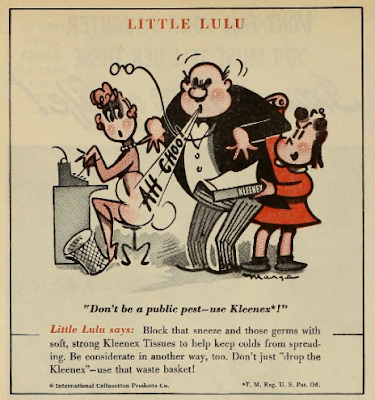 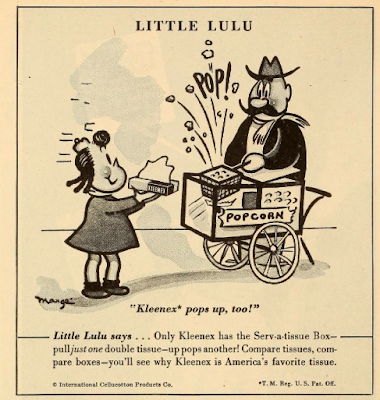 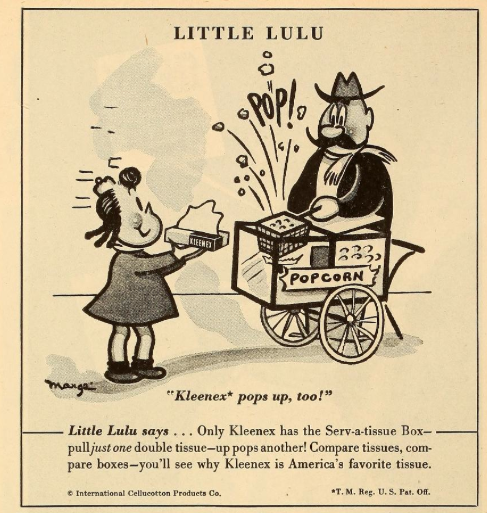 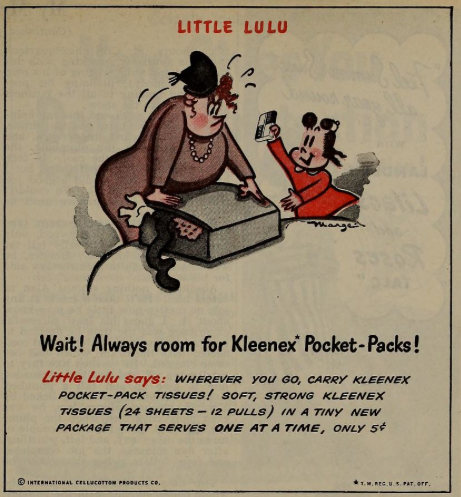 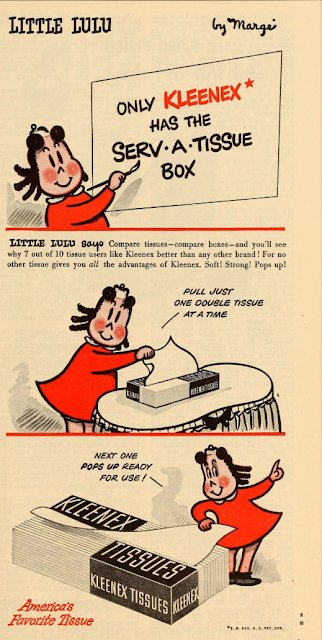 LITTLE LULU is justly lionized today for John Stanley's hilarious comic book adaptations but the original panel, by Marge (Marjorie Henderson Buell), started it all and, throughout the middle of the decade, Lulu was the ubiquitous spokesperson for Kleenex! 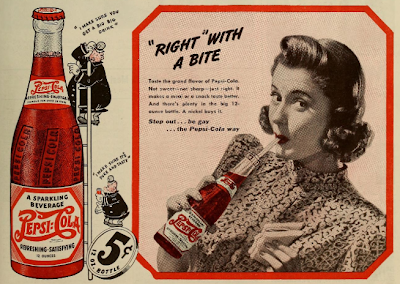 Here are a number of the very clever magazine ads. 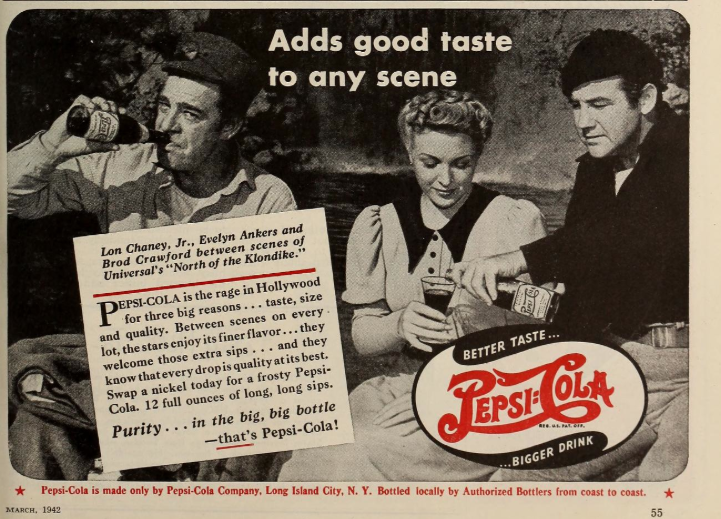 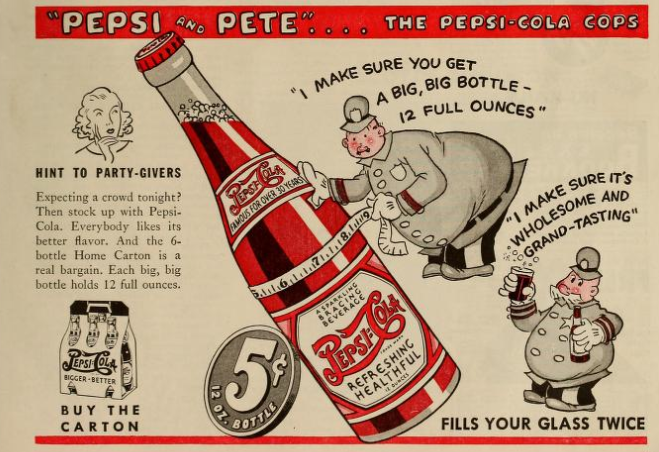 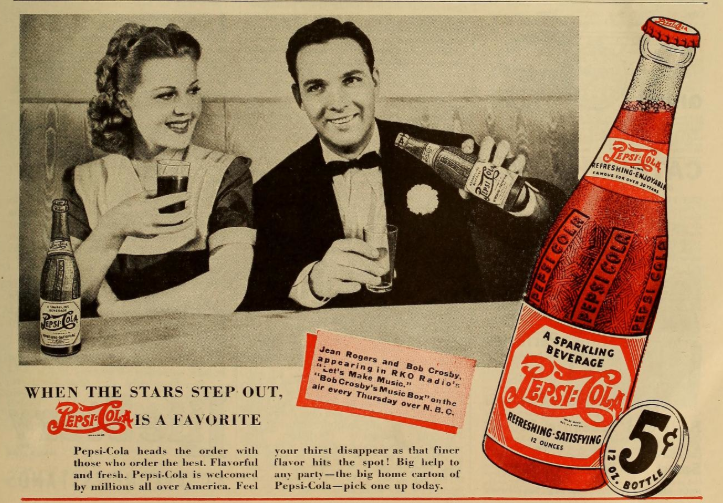 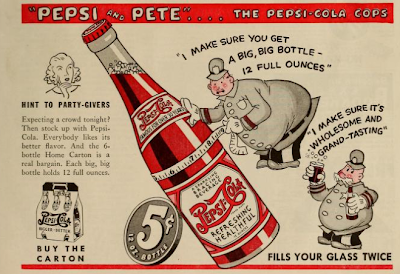 I just opened a Coke so under no circumstances should this post be taken as an endorsement of Pepsi-Cola. 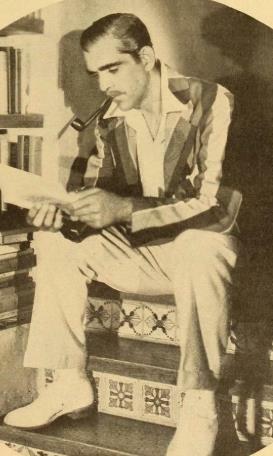 And doesn't Edmond O'Brien look vaguely like Dracula? How popular was BULLWINKLE (and Rocky) in 1962? 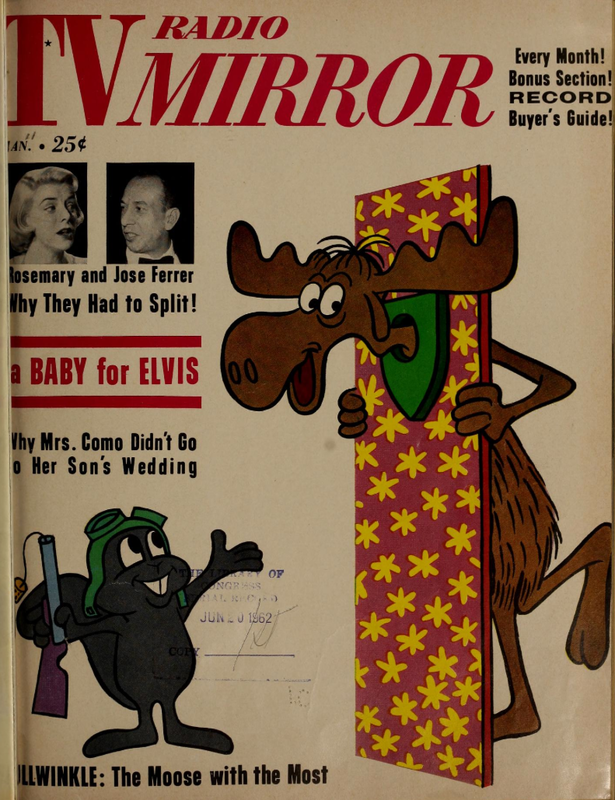 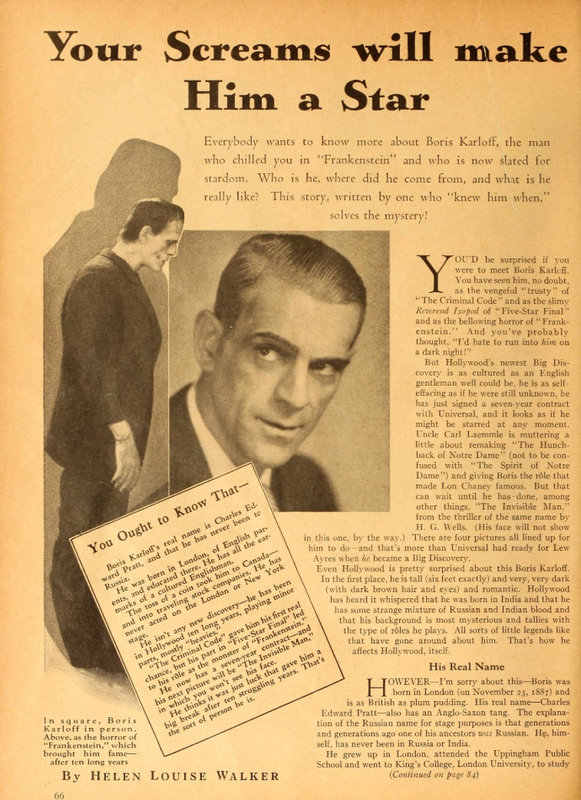 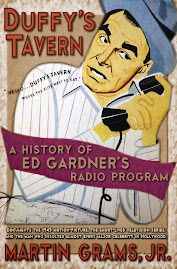 Popular enough to merit the cover story of this issue of TV RADIO MIRROR! 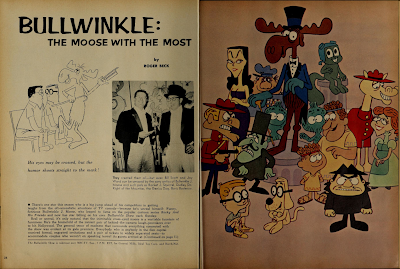 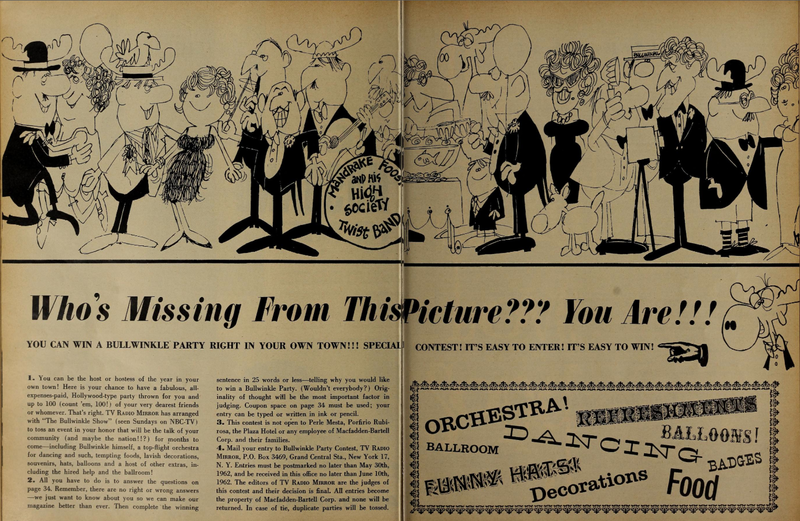 And here, a couple of months later, the mag was giving away a "Bullwinkle Party" to one lucky customer who filled out their generic "What would you like to see more of?" 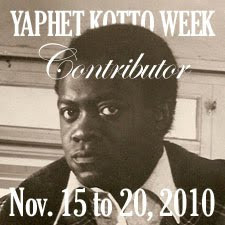 questionnaire!